We clean all meat to the best of our ability before being processed, Utmost care is used in preparing your meat for the freezer. Properly caring for your meat in the field is vital. When you leave your meat please let us know when you plan to pick it up, so that we can be sure it will be ready for you. You are also welcome to call the afternoon before your departure to confirm that your meat will be ready. 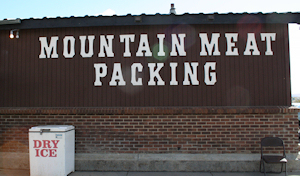 For your convience, Mountain Meat accepts Visa, Mastercard, Discover, American Express and Cash. You may prefer to pay for your processing at time of dropping your animal in order to expedite your departure at time of pick-up.